The book's appendices include an introduction to the International Society for Krishna Consciousness (ISKCON) and the Krishna devotee lifestyle, a brief biography of the author, a Sanskrit pronunciation guide, a glossary, and a directory of ISKCON centers worldwide. Many people are reacting to today's high-pressure, fast-paced life by “downshifting.” They accept lower incomes to pursue their special interests or to live with less stress in more natural surroundings. Often they will devote more time and energy to spiritual pursuits. Instead of vacationing in Disneyland, they go explore the mysteries of Stonehenge, Egypt's pyramids, or the temples of the Maya in southern Mexico. They find more inspiration and illumination in the teachings of lost civilizations than in the offerings of our modern consumer society. Surveys of students routinely report an increasing interest in spiritual fulfillment. This is a healthy trend. The sages of ancient India said, tamasi ma jyotir gama—“Don't stay in darkness, go toward the light.” They advised thoughtful people to embark on the quest for enlightenment. The final goal of this quest is not, however, attained by everyone. The Bhagavad-gita, India's classic book of spirituality, informs us that out of thousands of people who set out on the quest for enlightenment only a few will take to the right path, and of those who find the right path, only the most fortunate will achieve the final goal. Spiritual success requires determination and perseverance. In this book Srila Prabhupada shows us the true path of enlightenment and invites us to traverse this path from the dark night of materialism to the shining daylight of transcendence. Widely recognized by scholars and spiritual leaders as the most distinguished teacher of Indian culture and philosophy in the modern age, Srila Prabhupada is the perfect guide and companion for the journey along the path of enlightenment. The Quest for Enlightenment is a compilation of Srila Prabhupada's teachings, originally published as articles in Back to Godhead, the magazine of the Hare Krishna movement. Srila Prabhupada founded this magazine in India in 1944, and since then it has become the world's foremost journal dedicated to the teachings of Lord Krishna. The first chapter of this book describes the need to embark on the quest for enlightenment. The second tells of transcendental nature and how it differs from material nature. In the third chapter we learn about the attributes of the best kind of spiritual master to guide us on our personal quest. The fourth chapter outlines the techniques of yoga and meditation, and the fifth chapter explores spiritual solutions to material problems. In the sixth chapter Srila Prabhupada critiques modern science and philosophy. And in the seventh and final chapter Srila Prabhupada explains love of God, the highest goal for those on the path of transcendence. 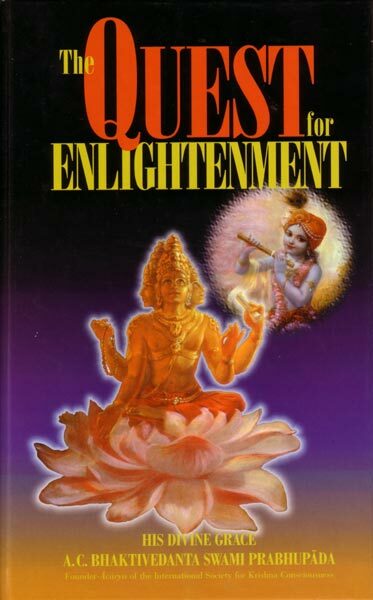 The Quest for Enlightenment provides a comprehensive and comprehensible guide to the path of spiritual progress. Srila Prabhupada speaks the truth without compromise. He represents the Vedic tradition faithfully and without personal motivation. And through his unique gift he communicates the most essential Vedic teachings to the modern world, inviting us all to embark on the journey that will take us from darkness to light, from the unreal to the real, from death to immortality. At the dawn of time Brahma sat in trance, seeking inspiration to create the universe, “Who am I?” he wondered. “Where have I come from? What should I do?” Then the Supreme Being, Krishna, revealed himself, flooding Brahma's heart with transcendental knowledge. Passed down since Brahma's time through an unbroken chain of gurus and disciples, that same profound knowledge is ours in The Quest for Enlightenment. The author of Quest is His Divine Grace A. C. Bhaktivedanta Swami Prabhupada, whom scholars and spiritual leaders worldwide recognize as the most distinguished teacher of Indian culture and philosophy of the modern age. With his spiritual lineage reaching back through Brahma to Sri Krishna, Srila Prabhupada is uniquely qualified to present the timeless Vedic teachings on yoga, meditation, reincarnation, and self-realization that have helped countless seekers in their search for ultimate peace and happiness. A special feature of Quest is a series of conversations in which the author gives the Vedic point of such Western philosophers as Socrates, Jean-Paul Sartre, and Carl Jung. “In my darkness I could have wished for nothing better than a guru,” wrote Dr. Jung, “someone possessing superior knowledge and ability.” Srila Prabhupada and the teachings he presents in The Quest for Enlightenment are what Jung—and we—are looking for.